Out of all the places to meet the love of your life… we wouldn’t have guessed it would be in the small Italian village of Positano. Positano is perched high above the Amalfi Coast, one of the most stunning and picturesque coastlines in the world; and one of the most famous. It is known for its narrow winding roads built upon jagged rocky cliffs, all set against the spectacular backdrop of sparkling turquoise seas that seem to stretch out infinitely. This is our hostel love story. Our story begins one afternoon underneath the glorious Italian sun, on the terrace of the Hostel Brikette. We were travellers from opposite sides of the world (Australia and Canada), it was a stroke of fortune that our paths would cross for three days during the European summer of 2015. University students at the time, we were backpacking on separate adventures. We immediately clicked and became friends. We had an amazing three-day fleeting friendship, which involved lots of laughter, gelato, sunshine and evening drinks with other like-minded travellers staying at the Hostel Brikette. 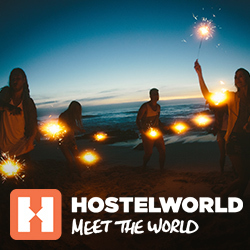 The terrace at the hostel is a great place to meet travellers from all around the world. The long picnic-style table creates a perfect social atmosphere, with enough space for many to join the conversation and fun. The staff is made up of mostly young international volunteers, who offer great advice on the local area and things to do and see while in Positano. They also happen to play good music and socialise with the guests creating one of the best hostel vibes in Europe. With drinks at a great price and happy hour basically running from 4:30pm to midnight, there is no better place to spend your evenings. The terrace also boasts panoramic views of Positano, especially gorgeous under the stars and with the dazzling city lights. Our three days together flew by. Before we knew it, it was time to part ways and continue on our separate ways. The friendship we formed over these few days left a lasting impression and saying goodbye was surprisingly hard. We kept in touch and stayed good friends for the best part of two years. In 2016 while travelling through Mexico I had a spontaneous idea. I built up the courage and asked my friend of only three days, now my cyber friend, if I could come visit her in Canada. Before I knew it, I was boarding a flight, not sure what was to follow. Positano felt like a lifetime ago, and after not seeing each other for close to two years, we were both excited and nervous. Would we still get along? Would things be awkward? Was this a mistake? After reuniting, it was like no time had passed at all, and we had no idea that our close friendship would quickly evolve into something more serious. As you can imagine, starting a relationship and falling in love with someone from the opposite side of the world has its complications. Me being Australian, and her Canadian, we decided that the best way for us to maintain a relationship and avoid doing long distance was to travel together. She quit her job and together we started our adventure with a one-way ticket out of Canada. Since being reunited, we have travelled for almost two years as a couple, taking us to 14 countries and counting. Our travels have involved many great adventures, isolated islands in Indonesia, teaching English in Vietnam, volunteering with rescued elephants in Cambodia, working at a hostel in Istanbul, whale watching the humpback migration in Sydney. Of all the places we had talked and dreamed about visiting together, we were both absolutely determined to return to where we first met, and this time as a couple. So what makes Positano so special? Aside from the sentimental reason of us wanting to return to where we first met, we both couldn’t wait to visit the charming, postcard-like village once again. Positano is a destination that would normally exceed any backpacker’s budget, having the reputation of being an exclusive holiday destination hosting many A-List celebrities. Accommodation options in Positano are mostly limited to 4 and 5 star hotels and luxury villas. This village does; however, have a wonderful and affordable hostel for those like us, travelling Europe on a shoestring budget, who want to experience the charm and magic of Positano. The Hostel Brikette is located at the very top of Positano, which offers spectacular views overlooking the Tyrrhenian Sea. The view comes at a price, be prepared for the many steep steps it takes to get down and back up from a day at the beach. An added bonus is you’ll definitely be burning off all the pizza, pasta and gelati consumed throughout your Italian travels. After checking in to the hostel, an overwhelming sense of déjà vu and nostalgia came over us. Returning to Positano instantly jolted fond memories of past travels, and we were eager to explore more of the village once again, this time hand in hand. At first glance Positano seems impossible. The entire village is clutching onto the cliffs of Monti Lattari, with the colourful houses built right up into the near vertical hillsides, sometimes seeming to be touching the clouds. One can barely imagine how this ancient village was constructed and how materials were hauled up the steep hillside for the building of these charming houses. Having already been to Positano, we knew what to expect. Nonetheless, the charm of this village somehow managed to leave us in total awe and disbelief all over again. With only one main road accessible by car, the real treasures of Positano are best explored on foot. Wandering through the narrow streets and stairways, we came across unassuming local houses covered in magenta bougainvilleas. Strolling through these beautiful streets was one of our favourite ways of seeing new parts of the village, often not ventured into by other tourists. While making our way down to the centre towards the beach, we would turn a corner and be blown away by the breathtaking sights of the incredible landscape. After the long trek down to the centre, we wanted nothing more than to jump into the refreshing crystal clear sea. The main beach in Positano, the Spiaggia Grande, is 300-metres long and one of the largest, grandest and most glamorous beaches on the Amalfi. Lined with gorgeous seaside restaurants, bars and charming little boutiques selling local specialities to tourists, it is a wonderful place to spend countless hours. The Spiaggia Grande also offers the most amazing view of Positano’s pastel coloured, cascading houses clinging to the cliffside, so you’ll definitely want your camera at the ready! Positano is a pebble-beached village, the smooth black stones are surprisingly comfortable to lie on but as the heat of the day rises, they become extremely hot, especially if walking around bare foot! Thankfully the beaches offer the perfect solution. There are hundreds of rows of sunbeds that line the beaches, providing beach goers oasis. Paired with the most colourful and pristine umbrellas imaginable, they compliment the beauty of Positano. With three scenic beaches linked by a costal walkway, beach-hopping here is a must. The sun setting, the smell of fresh seafood being prepared and rumbling stomachs marked the end of our perfect beach day and announced dinnertime. Originally known as a quaint little fishing village, Positano’s cuisine is still naturally centred around seafood. The food is extremely fresh, and as with the rest of Italy, the produce is prepared in the style that makes Italian cuisine such a global favourite. Eating here you quickly realise that the real gem of Positano is the lemon, which is used in both savoury and sweet dishes. These are no ordinary lemons, for this variety of lemon grows only on the Amalfi Coast. Known as “S’fusato d’Amalfi”, they have been developed over a thousand years and are a cultural emblem in this region of Italy. The lemon tree adds a colourful touch to the terraced landscapes, and is a popular symbol in the hand-painted ceramics and decorations around the village. The S’fusato d’Amalfi grows here in abundance, and the Italians use them in almost everything, for cooking (roast potatoes, meat, salad dressings and of course gelato) cleaning and even beauty products. But perhaps the best use for the S’fusato d’Amalfi lemons is saved for after the meal, which is the digestivi liqueur known as “Limoncello” said to be an aid in helping with digestion. Although it seems to me more like an Italian excuse to continue drinking after the meal is finished! A specialty from this region of Southern Italy, Limoncello is the perfect blend of sweet and tart. It’s tangy, yet undeniably refreshing which masters the balance between acidity and sweetness. So when life gives you lemons, well… drink Limoncello! Retracing our footsteps through Positano, and reliving them as a couple has been nothing short of incredible. Positano is the reason for our relationship, and those three days of serendipity where we crossed paths will always be a time we will cherish and hold dear. We will always be grateful to the Hostel Brikette for bringing us together, and we will find any excuse to come back to the gorgeous village along the Amalfi Coast. What this experience has taught me is that you never know what’s around the corner, who you’re going to meet and where you might end up! P.S. I asked her to marry me on our last day in Positano…She said yes. My name is Louis Cuthbert; I have been travelling the globe for the last two years and documenting my adventures. Follow our journey on Instagram @one_globe_travels. The post Returning to the hostel where we fell in love appeared first on Hostelworld Blog.